Fresh on the heels of my kitchen overhaul the other day, before the adrenaline wore off completely, I jumped in to re-organizing our pantry. I don't really know how to explain what has come over me. Could it be the power of my little word? Maybe. 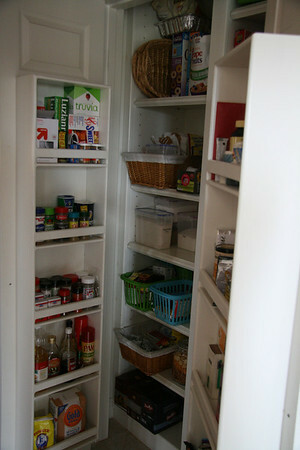 This is the second time in two years or so I have tackled our pantry, I guess the first time didn't take. My fingers are crossed that this one will. 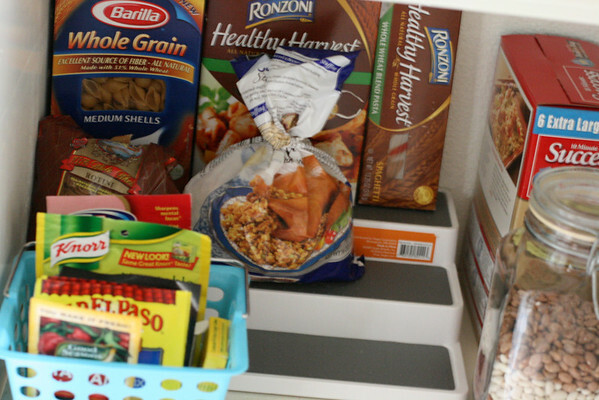 This time I took most everything off the shelves, threw away things that had expired (gasp! 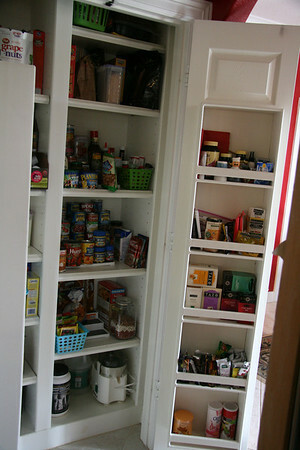 ), arranged similar items on shelves (cereal together, canned goods together, etc.) and also grouped things together using baskets. Can you believe I tried to cram all of my baking supplies on one shelf? Every time I needed something, I had to dig, shove and hope nothing fell on my foot. Now I have two shelves for baking supplies. 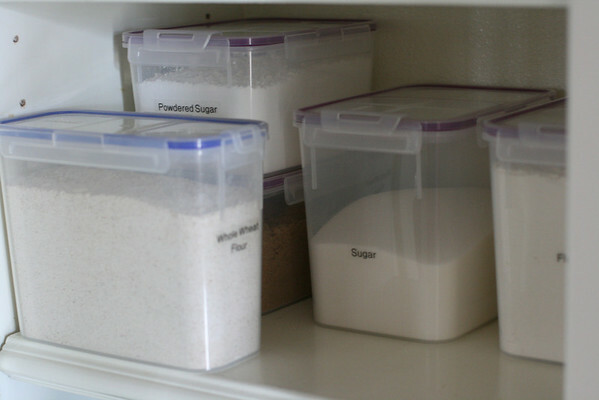 One shelf has baking staples like flour, sugar, etc. in Snap Lock containers. Oh, look, I even labeled them (which was highly satisfying). I used Dollar Tree baskets to group other baking supplies like, extracts, sprinkles, chocolate chips, and small staples like cocoa and yeast. 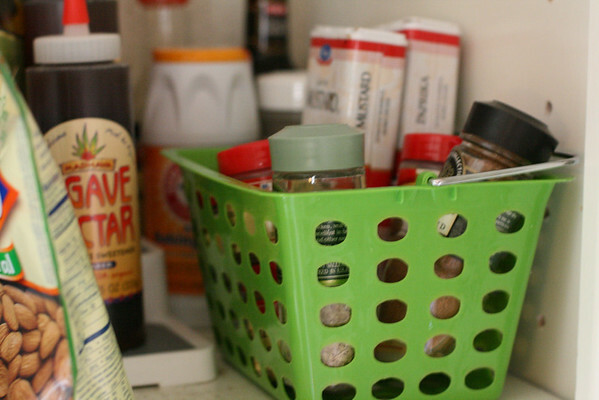 I kept the spices I use most frequently in the door shelf and placed others not used very often in another small basket. This wicker basket is for easily accessible snacks for Annelise. The filled jar makes me ridiculously happy. I also bought another stair-step organizer (I have two others for canned goods) to help organize our rice, pastas and miscellany. Yes, that's one more dollar store basket, this one for seasoning packets/soup mixes. I couldn't resist filling another jar with dry beans! How much did this re-organization cost me? Well, I'm so glad you asked. 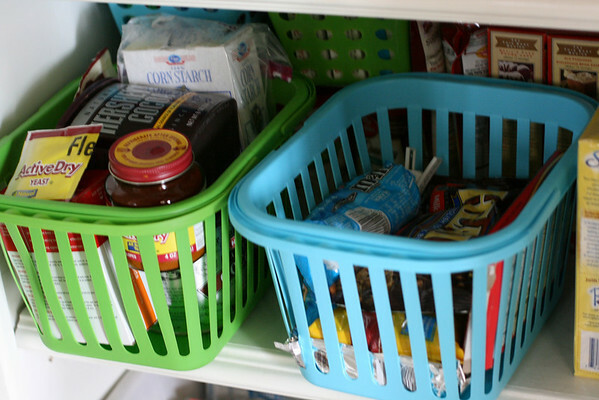 I bought four new Snap Lock containers for around $20ish, a stair-step shelf for $7ish, and $6ish for plastic baskets. Everything else we already had. Not too shabby, eh? Once I got going, it only took a few hours. What had I been waiting for anyway? It was not as overwhelming as I had feared and I feel such peace now that it's finished. Just like when I finished the kitchen project, I find myself opening up the pantry doors and admiring my efforts at odd moments throughout the day. I know, I need to get a life. I better keep this organizing frenzy going while I still have the mojo. Where will I strike next? Closets? Utility Room? Annelise's Room? Craft Room? Sadly, the possibilities are endless. My life will not be complete until I get some stair stepper thingies of my very own. Oh this is so pleasing to see! I love it when I get my organizing mojo going and end up with a functional space. Way to go! 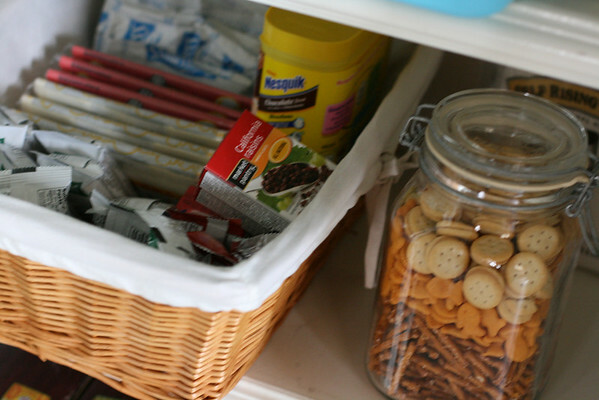 The woman who teaches the organizing class I'm taking suggests having a whole mixing center in the kitchen, so all your supplies are close together. I have some of my supplies close together, but others are in the pantry and on top of my fridge so I'm going to overhaul the area completely. I realize now how much time I was wasting looking for things or buying duplicates of things because I couldn't see that I already had it. Here's hoping I can maintain the order! Love the little baskets. What a great idea! The filled jar would make me happy too - how fun!